This writeup goes over details on how to build and install a Kali Linux image for an Overo Gumstix board. 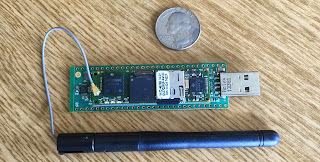 The build notes and images in this post are for a stock Kali Linux OS configured for a Gumstix Overo device. The Kali image is configured for easy SSH network access over wired, wireless or USB when the Gumstix device is powered. In order to create as Kali Linux device that resembled a USB dongle, I chose to use a Gumstix Overo Firestorm-P com with a Thumbo daughter board. 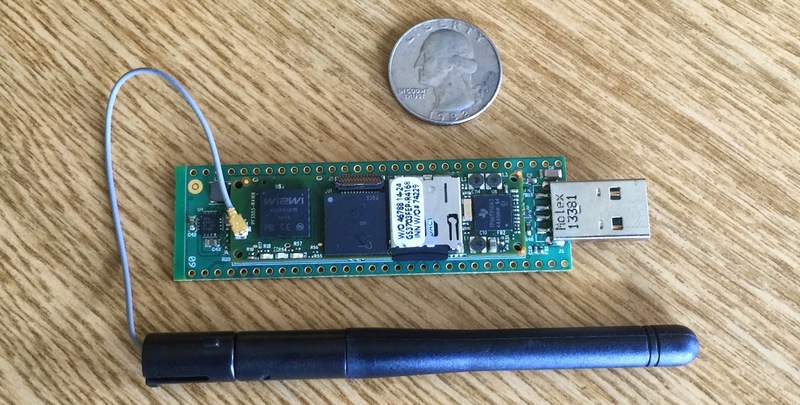 The device is WiFi enabled and runs most pentest tools relatively well. As Gumstix devices are low resource ARM devices, there are obviously some CPU limitations, but considering the hardware, it runs great. This Kali build utilizes the kernel, modules and firmware from the Gumstix Overo Yocto build. You do not have to build your own Yocto image as this documentation utilizes a precompiled version, but if you are interested in building your own, you can check our my previous post "Building Yocto Linux Images for the Gumstix Overo"
How to manually build a Kali Linux image for a Gumstix Overo. An alternative scripted method to build a Gumstix Kali image. Where to download a precompiled Kali Linux Gumstix Overo image if you are not interested in building them yourself. How to install a Kali Linux image to an SD card for your Gumstix board. These steps build a base Kali Linux OS for the Gumstix Overo board and uses files, kernel modules, firmware obtained from a Gumstix Overo Yocto build. You do not have to build your own Yocto image as this documentation utilizes a precompiled version, but if you are interested in building your own, you can check our my previous post "Building Yocto Linux Images for the Gumstix Overo"
These build steps were tested on Debian 7.7, Ubuntu 14.04 and Kali Linux 1.0.9 host system. NOTE: This documentation utilizes the deboostrap command so you will likely have to build this on a Debian (Kali is Debian based) or Ubuntu based system. There are some tricks to get around this, but they are not covered here. First we will create a build directory. It is not required that you follow the same directory build structure. However, if you do use a different directory structure, you will have to substitute your directories in my build commands. Debian and Ubuntu do not include a Kali Linux debootstrap file. If you are doing this build on a Kali Linux host machine, you can skip this step. In this step, we create our base Kali OS with deboostrap. This is often called "First Stage" build. This step utilizes a precompiled Yocto image I created. Optionally, you can obtain one directly from Gumstix here or build your own using the steps I provide here. In this step, we copy over our Yocto kernel modules and system files we downloaded or built from the previous step. This is typically called "Second Stage" build. this section is broken up into smaller subsections. During this stage, you may choose to customize network interfaces, passwords, etc. Feel free to set your own password here, but remember it so you can ssh into your system after installation. Feel free to add more apt repositories if you like. Here we set up our WiFi networks and passwords for the WiFi networks you would like your external interface to connect to. In this step we setup our internal (USB) network interface. Feel free to use a different static IP address and CIDR block if you prefer something different. In this step we setup our internal (USB) network DHCP. If you changed your IP address information in the step above, you will have to change the DHCP settings to match. In this section we will finalize the third stage configuration. This step bundles a lot of Kali Linux configurations into a large blob. It could likely be broken up into smaller steps to make it more readable. Unfortunately for now, it is how it is. Copy, paste, cross your fingers and close your eyes... Your almost to the finish line. If you prefer a different locale, then change it accordingly. This step cleans some logs and unmounts partitions from our stage three steps. Finally, we tar up our configured Kali filesystem. This filesystem will be used during the install stage for our Gumstix SD card. In order to speed up the Kali Gumstix build process, I have composed a bash script from all of the manual build steps described above. The script can be found here. This script was tested on a base Debian 7.7 , Ubuntu 14.04 and Kali Linux 1.0.9 system. The script contains sudo commands so it will prompt you periodically for a root password when it needs to run privileged commands. The build script that encapsulates all of the manual build steps can be obtained from by github repo as shown below. Note this script assumes you are running as a normal user and will prompt you for a sudo password. If you are not interested in building Kali from scratch, you can always download and install precompiled images. The image provided below was generated by myself from the steps listed above. Once you have built or downloaded your Kali Linux Gumstix image, you can use the steps listed in this section to flash the image to an SD card. You can then use the SD card to boot your Gumstix board. Download Uboot Files if you Don't Already Have Them. If you built your image manually and did not download it, you will have to obtain a MLO, uImage and u-boot.img file. To get these you can grab them from a Yocto build or download them with the following commands. On a Debian system your SD card partitions should automatically get mounted to /media/boot and /media/root. If this is not the case then make sure your SD cards are mounted and substitute the mount directory referenced in the instructions below. The manual build steps above and the precompiled images set up the base Kali OS to be easily accessed via ssh over wifi, ethernet or USB networking. The easiest way to access your Kali system is via SSH over the USB network interface it provides. Plug in your Gumstix board which is attached to a daughter board with a usb device port (Tobi, Thumbo, etc) to your host computer. The precompiled image (or images created with the build script) is setup with the password "toor" for the root user. SSH to the usb network interface located at the address listed above. The Kali image is configured to serve your host computer a DHCP address in the 172.16.1.0/24 block. SSH to the ethernet interface if you are using a daughter board with ethernet capabilities (Tobi, etc). The eth0 interface will pull a DHCP address. SSH to the WiFi interface. This will require that you setup your wpa supplicant file located at /etc/wpa_supplicatnt/wpa_supplicant.conf prior to flashing your SD card. Hopefully you have found this document for installing Kali Linux on a Gumstix Overo useful. Many of the steps can be altered to install different operating systems. With a little alteration of the debootstrap command, you should be able to install any OS supported by debootstrap. This document can also be altered to install Kali based operating systems to different hardware such as the Gumstix DuoVero series. As the only Gumstix product I own is an IronStorm-P COM with a Thumbo and Tobi board, this document only focuses on this hardware. If you have any comments or questions please feel free to send them my way. You can post comments here or contact me via Twitter @hackgnar.